How can I improve my ad’s position? Google uses a value called Ad Rank to determine the position of your ads each time they are eligible to appear – and whether they show at all. This is calculated using your bid amount, your ad quality (Quality Score, which takes into account factors such as expected click-through rate, ad relevance and landing page experience), the context of the person’s search (for example, the person’s location, device, time of search, the nature of the search terms, the other ads and search results that show on the page and other user signals and attributes) and the expected impact of extensions and other ad formats. This means your ad position can fluctuate each time, but there are two ways to improve an ad’s performance – bid adjustment and quality improvement. In this regard, both the easiest and most cost-effective way to improve the performance of an ad campaign is to ensure it is of the best possible quality. The extra time and money put into developing quality ads can be recouped in the reduction of the cost-per-click. Ensure that the landing page to which your ad directs a user is unique, relevant and engaging. Use in-depth keyword research and buyer personas to maximise the relevance of your ad, not only to the product, but to potential searches, and searcher intent. Employ tools such as Google’s Keyword Planner to analyse historical data and ensure your ad capitalises on historic click-through performance. Make use of available, relevant ad extensions. There are plenty of ad extensions available to brands, and the time required to implement them is far outweighed by the benefits of it. Bid as much as a click is worth to you – though the bid amount is not a deciding factor often, it is better to have an amount in reserve to maintain a prominent position. How should I organise ad groups in Google Ads? An ad group contains one or more ads which target a shared set of keywords and are where you will write your ads and choose the keywords that will trigger them. Use ad groups to organise your ads by a common theme, such as the types of products or services that you want to advertise. The more ad groups you have, the greater the specificity and targeting options you have to ensure your ads are getting in front of the right people. A common method of organising a Google Ads account is to do it with a category or business goal in mind – many advertisers base their ad groups on the sections or categories that appear on their website. For example, let’s say you sell desserts, drinks and snacks on your website. In the table below, each ad group contains a keyword list focusing on a particular product. The keyword list in each ad group tells our system to show ads for these products only on websites related to them. Within a particular ad group, you should choose keywords that are closely linked to your ad text. 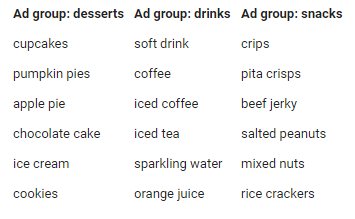 For your drinks ad group, you might try keywords for different brands, flavours and prices for the drinks you sell. What are the core areas to consider when developing a keyword list for PPC? When researching your keywords, the first step is to identify the audience you’re targeting. Think about who, what and where your target audience will be searching for when trying to connect with sites like yours. This Google Ads tool is essential when creating keyword lists. Firstly, it gives you the option to search for keywords by volume using a generic or specific topic (ideally you’re looking for the golden ration of low competition and high volume). You can then narrow this down by location, product category, language and network. This makes the suggested keywords as specific to your business as possible. Your landing page can also be added to the search, which will improve the Quality Score of the keywords fed back because of their relevancy to your landing page. You can use as little or as many of these options as you like, but the more you use, the more specific the results will be to your business. Use your brainstorm ideas to expand your Keyword Planner research further. To exhaust all possible variations, the Multiply Keyword Lists tool within the Keyword Planner is extremely useful. This gives you the option to combine multiple keyword lists, for example, combining ‘Remote Control Helicopter’ and a list of colour variations. This can be a great time saver but the tool also provides forecasting information that can be used during the planning process. Predictive technologies like Google Autosuggest and Related Searches are a goldmine of information. Test your keywords in Google Search and see what suggestions it comes up with – these are the same suggestions potential customers will be seeing when they make similar searches, making this information extremely valuable to your keyword research. Think like a customer – pick short and long tail keywords likely to be searched by your buyer personas. Look for gaps – in a crowded marketplace it can be difficult for newcomers to compete against established companies. So don’t compete, find where they aren’t present. Rank for priority – it is counterproductive to spread yourself too thin, so choose your targets wisely and look for the golden ratio of high volume, low competition. Consolidate gains – if you begin to rank for certain terms, don’t rest on your laurels but continue to target these keywords as you expand your target list. How can I monitor keyword performance? The search query report (SQR) tool within your Google Ads account is a must for developing your campaigns. The SQR allows you to research what queries are connecting to your current keywords and allows you to refine your keyword targeting with negatives, as well as identify opportunities that you are currently missing. Improving relevancy is one part of improving Ad Rank and Quality Score, which can boost your click-through-rate and save you money in bids. Looking to hire a PPC agency? Find out how to evaluate the options – or contact us today for a free, no-obligation audit. Paid Search (PPC) platforms have been growing and enhancing their offerings for more than a decade, it can be quite confusing. With Click Consult’s help, that need not be the case.